While Lewis Carroll did not create the rabbit hole, he did turn those holes into a literal abyss down which people could fall. Today, “rabbit hole” has become a metaphor for extreme diversion, redirection, or distraction. Industries spiral down them all the time, resulting in a talespin that, sometimes, cannot be rerouted. The incident report from NASA’s Aviation Safety Reporting System (ASRS) details the Captain’s response and reaction: “At this time, the [international pre-departure] inspection was complete, and I was allowed on the aircraft. I found two mechanics in the flight deck. I was informed that they had not been able to find the snake, and they were not able to say with certainty what species of snake it was. The logbook had not been annotated with a write-up, so I placed a write-up in the logbook. I was also getting a line check on this flight. The Check Airman told me that his father was deathly afraid of snakes and suggested that some passengers on the flight may suffer with the same condition. 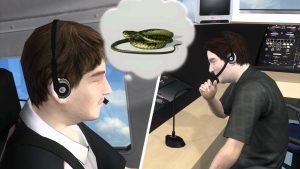 “I contacted Dispatch and discussed with them that I was uncomfortable taking the aircraft with an unknown reptile condition. . . . The possibility [existed] that a snake could expose itself in flight or, worse on the approach, come out from under the rudder pedals. Dispatch agreed with my position. The Gate Agent then asked to board the aircraft. I said, ‘No,’ as we might be changing aircraft. I then contacted the Chief Pilot. I explained the situation and told him I was uncomfortable flying the aircraft without determining what the condition of the snake was. I had specifically asked if the cleaning crew had really seen a snake. I was informed, yes, that they had tried to vacuum it up and it had slithered away. The Chief Pilot agreed with me and told me he would have a new aircraft for us in five minutes. We were assigned the aircraft at the gate next door. Don’t wait for a snake-in-the-cockpit experience to improve your processes. Reach out to TapRooT® to curtail rabbit holes and leave nothing to chance.